It’s finally warming up here in Korea and I could not be more elated about this. We’ve been told by several people that this winter was “mild” by Korean standards and I still think it was just so cold (at least, compared to what I’m used to in California). Spring means more time outdoors–I’m planning some hikes for later in the season and I play ultimate frisbee almost every weekend as part of a league I joined. We recently played in our first tournament, which was a lot of fun. A lot of the self-driven frustration with needing to improve quickly took a backseat to the priority of just playing and I had a lot of fun. I even scored a point for the team in our final game, which was really exciting. However, as lovely as the warming weather is, this is the season for hwangsa, the yellow dust that blows over from China into Korea and Japan. We’ve already had one dust storm that lasted about a day but of course, we do expect more. Jerry bought us some masks to help protect our respiratory systems during these storms, too, which I’m sure will come in handy if things get pretty yucky. The most recent storm saw air particle levels in the 200s, which is definitely ‘unhealthy,’ however this was incredibly brief–I think we each expected these storms to last days, but the levels only spiked for a few hours that day while we were inside for classes. It’s easy to get concerned about the dust storms–there is no shortage of horror stories online that are so sensational you can’t help but wonder if they’re totally bunk–but we’re pretty well-prepared. Aside from masks, we’re signing up for electronic notifications from the Korean weather service, which sends us text messages in advance of a coming storm so we know which days we’ll likely need to grab our masks. We each monitor the air quality on our phones (God bless technology! ), so I know when things creep above 100 particles or the ozone looks high, it’s time to opt for indoor activities and skip the run for the day. Overall, I can’t wait for spring to really get underway. Bugil is famous for their Cherry Blossom Festival, which happens in mid-April, when the campus’s cherry trees are in full bloom. There are currently pops of color in the Korean forsythia (a bold yellow) and some purpley-pink flower I can’t quite identify. 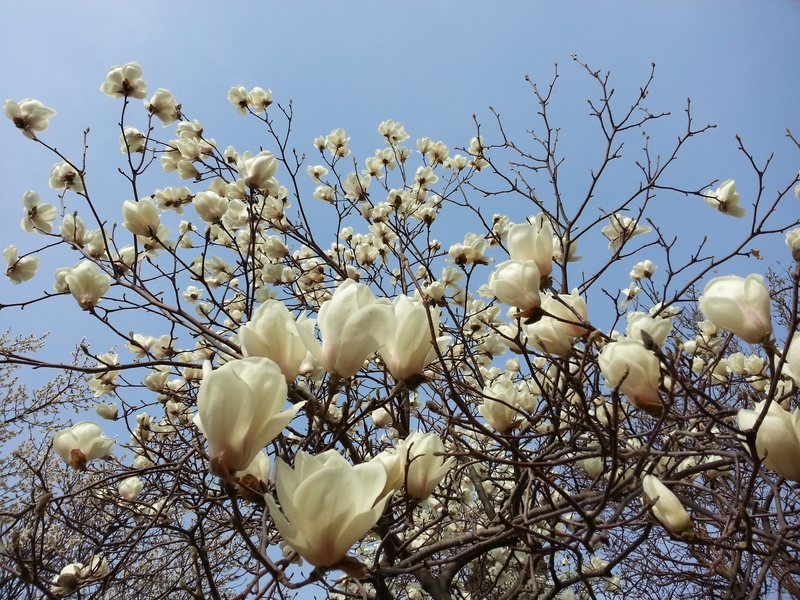 The photo above is of one of the magnolia trees outside the building I work in, which fragrances the area so nicely. After what seemed like an intense winter, I’m incredibly grateful for and welcoming of these warmer temperatures. 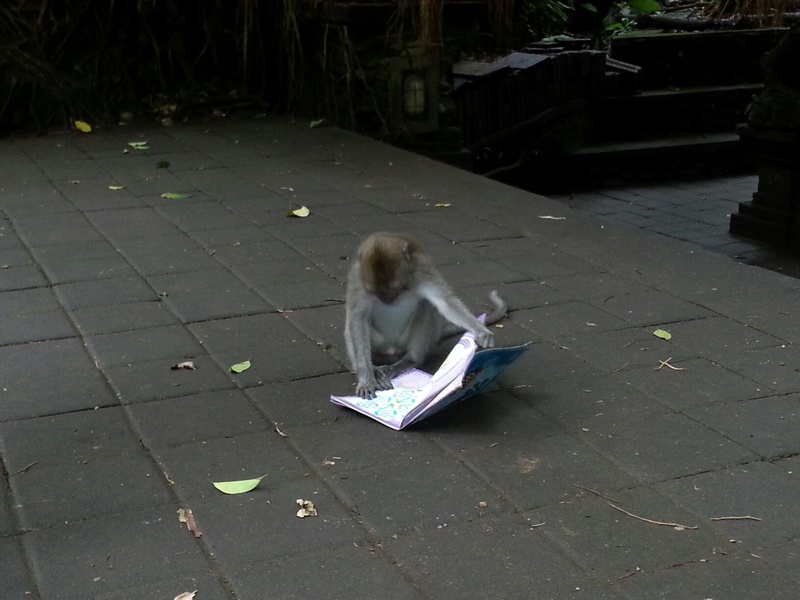 This is the third in a series of posts about our trip to Bali. You can find the first here, and the second here. 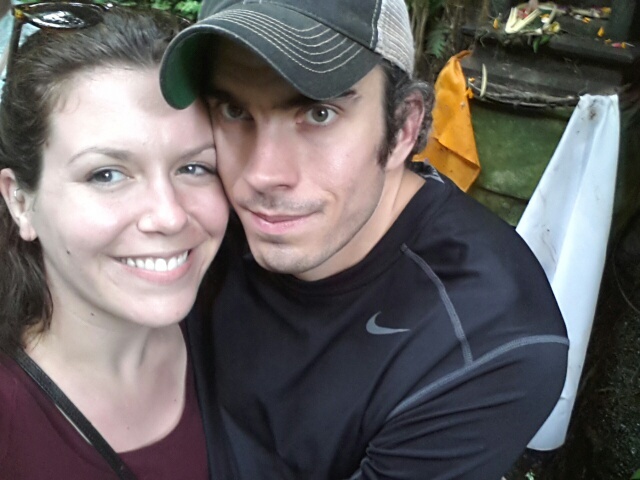 Our second day was spent chiefly in the Sacred Monkey Forest. After a late breakfast (accompanied by Balinese coffee, which I was an instant fan of), we hit up the monkey forest and paid for some bananas to offer them. The Forest is home to over 500 grey macaques who often wander out of the forest during the day to look at the tourists. 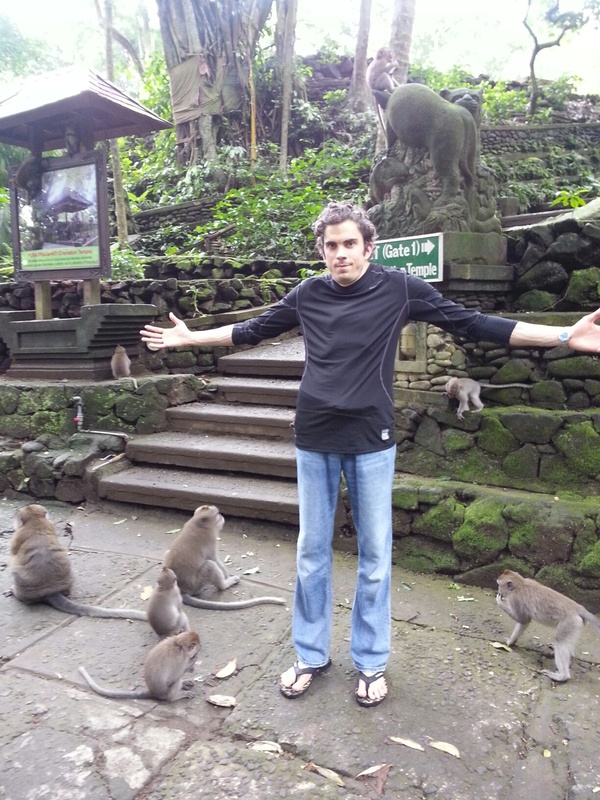 A friend of ours had warned us about the monkeys becoming aggressive at times–his Bali vacation was nearly spoiled by an emergency trip to get a rabies shot after one of these monkeys bit his hand when he did not want to give it his cell phone–so were excited to see them, but also wary of possibly getting too close. 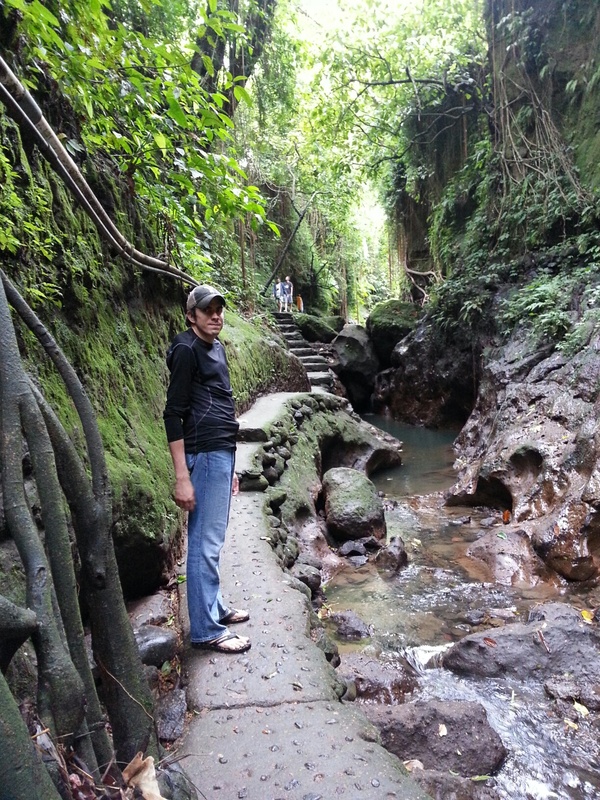 Inside the ravine, following the path to the bathing temple. The monkeys were not shy at all, but we found our bananas were quickly finished when one approached me and grabbed the bunch instead of the single banana I was offering. Not wanting to upset him and risk a bite, I didn’t even try to resist giving them and instead, watched him scamper off and be pestered by a monkey buddy also wanting to share. The last photograph we have of Jerry wearing his hat. 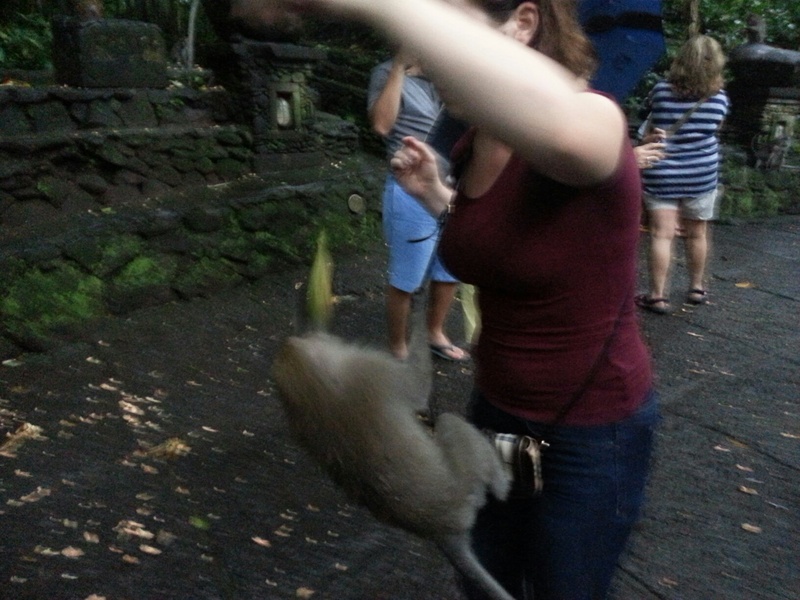 This monkey absconded with Jerry’s hat and then tried to eat it. The remainder of the afternoon was spent in cafes and doing some shopping (there are still gifts in our apartment waiting to be sent to our families…)–we had tried to see about a Balinese dance performance, though a storm came in and the show was canceled on account of the rain. A bit of a bummer, but oh well. The next day’s travel plans would take us to Kuta, known for its amazing surfing. Waiting for the rain storm to pass–it didn’t. Inside the main temple within the Monkey Forest, wearing green sarongs to follow the dress code. 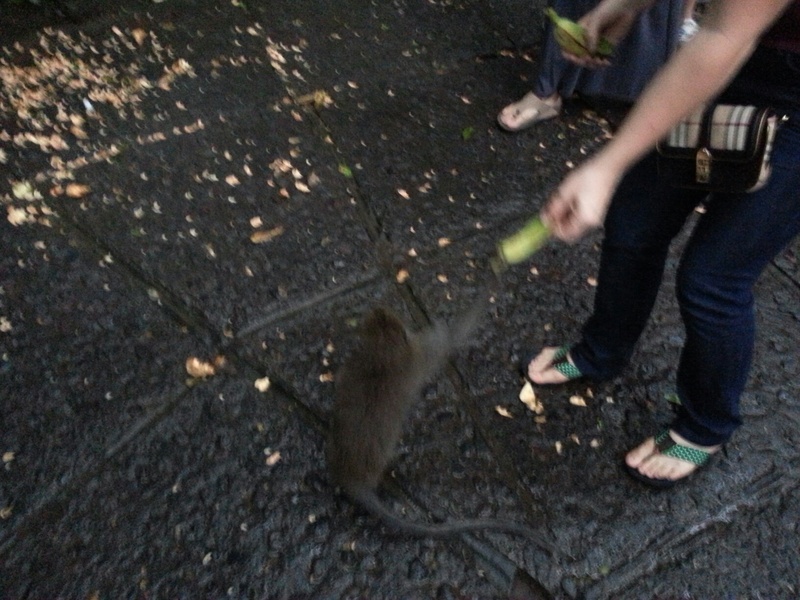 Feeding a macaque… They move fast! 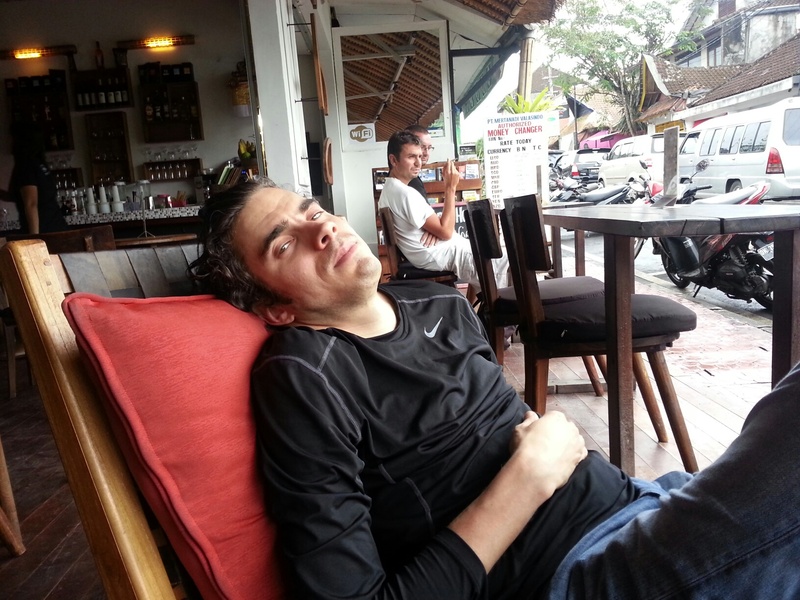 Taking a break at a cafe in Ubud–after this, we went back for more monkeys and then went shopping. Jerry, surrounded by his minions. Instead of one massive post, I’m breaking this up into sections–you can find part one, here. View from the restaurant at the resort where we stayed. This and Balinese coffee made for a wonderful wake-up. 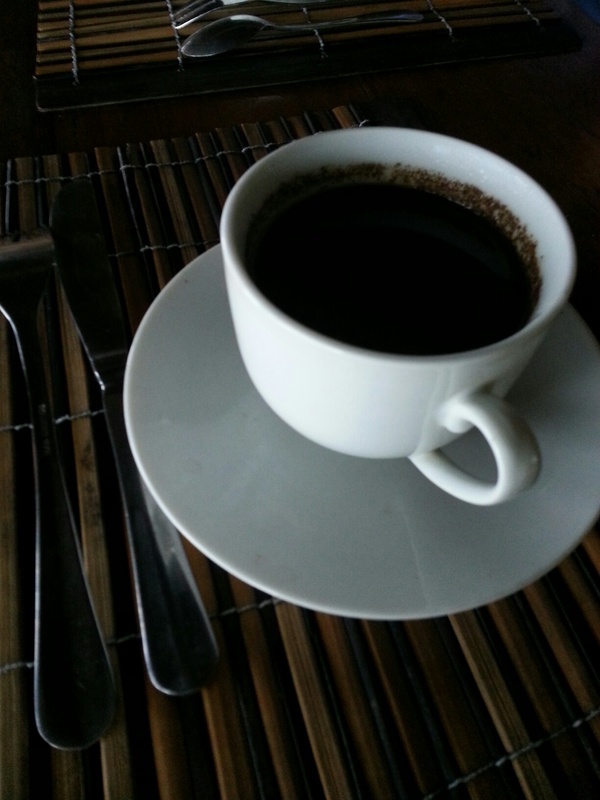 Balinese coffee–thick, dark and delicious. I was an instant fan. On our last night in Amed, we arranged a ride to our next destination (Ubud) through the concierge and went swimming in the private pool for our cabin. If there is one thing I will always associate with Bali, it might just be plumeria–there were huge trees surrounding our cabin and the pool, making the air so fragrant. Jerry discovered Amed while surfing a CNN travel page talking about lesser-known beach areas to visit. 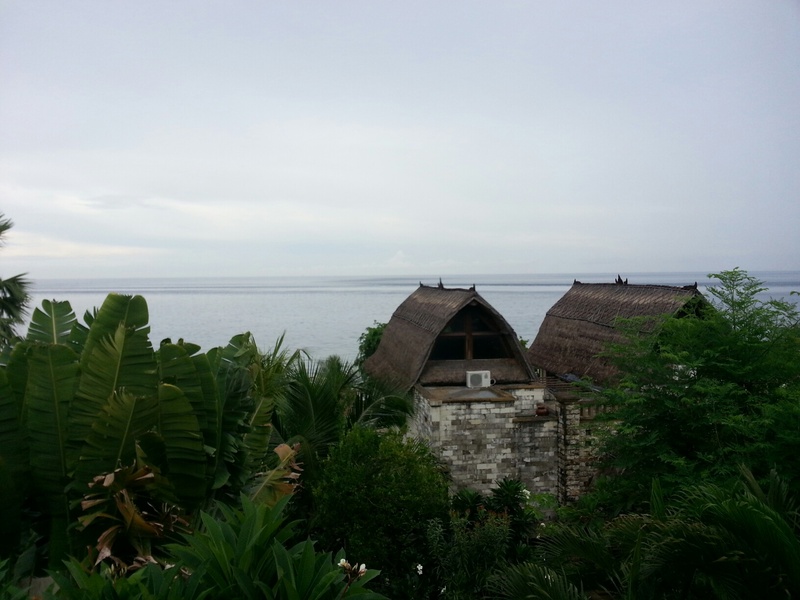 A more remote location in Bali, Amed was a sanctuary. Volcanic beaches, amazing snorkeling (there’s even a shipwreck to see underwater if you can get out that direction) and so many beautiful flowers and trees. 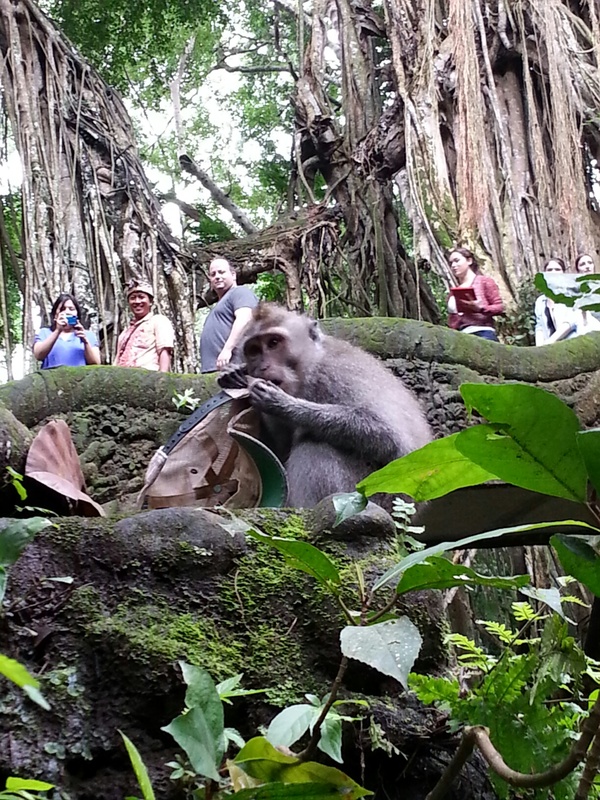 Ubud is more of a culture hub for Bali and also boasts one of its most popular tourist points: the Sacred Monkey Forest, which we were very excited to see. Rice field on the way from Amed to Ubud. The morning we left, we ate breakfast at our hotel and soaked in a bit more of the view before starting to get ready. I think we were both reluctant to leave because we were so relaxed and loving where we were, but we were also excited to see what Ubud had to offer. We had two nights in Ubud, then onto Kuta. The man who drove us to Ubud was so nice, stopping along the way so we could take pictures of the beautiful, verdant rice terraces. 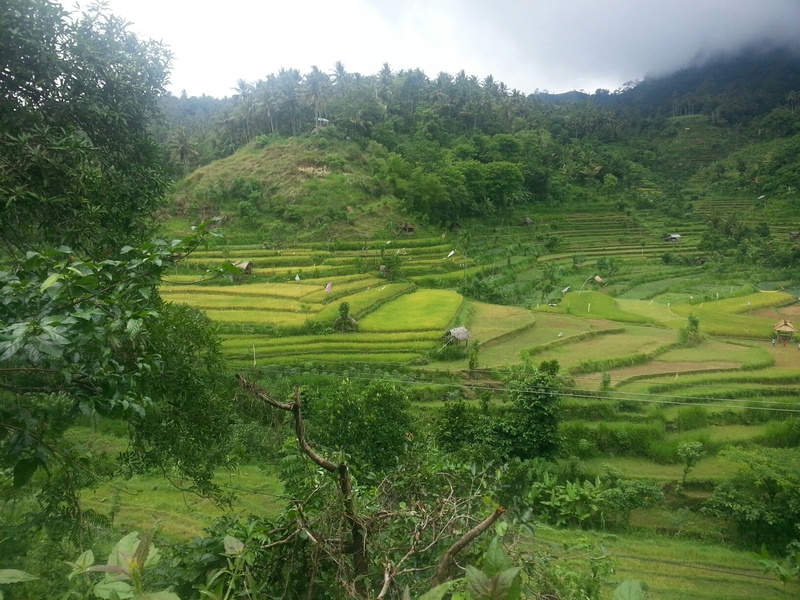 One of the many tiered rice fields in Bali. “Would you like to see the water palace?” he asked. Not knowing what that was, we agreed, thinking it probably wouldn’t be much and we’d be on our way. He pulled over at one point and we all walked across the street to what looked like a fairly busy marketplace. Meandering through fruit stands and people shopping, we stopped at a small building and through a tiny window, we received tickets for the Tirtagangga Water Palace. 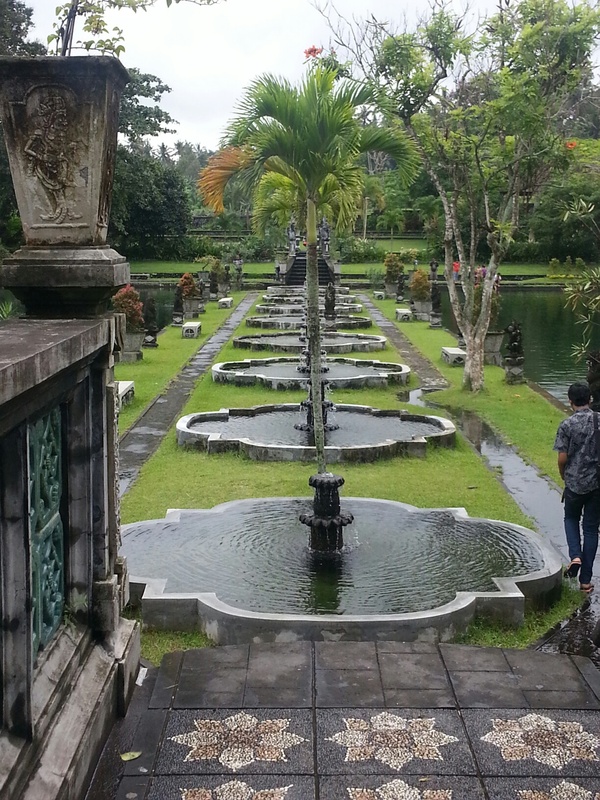 Part of the Tirtagangga water palace, nestled deep behind the temple. Upon walking up the small, stone steps and through the gate, I think my jaw actually dropped to see how beautiful a place it was. The area was largely composed of large pools, one with a maze of stepping stones working through it that people were walking along. Statues punctuated the maze as you walked through, and the stepping stones turned out to be less stones and more columns that had been leveled off so people could walk easily. This meant, though, that you really needed to watch your step as poor footing would cost you a fall into a pool full of koi with water about waist-deep. 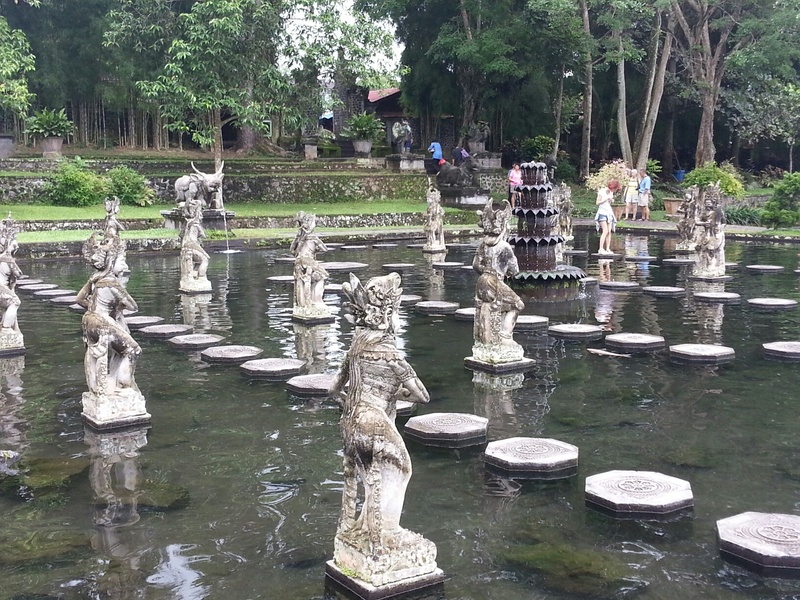 Statues in the maze at Tirtagangga water palace. Each stone was approx. 2.5-feet wide/long, but dropped off about three feet if you were to step off the edge and into the water. 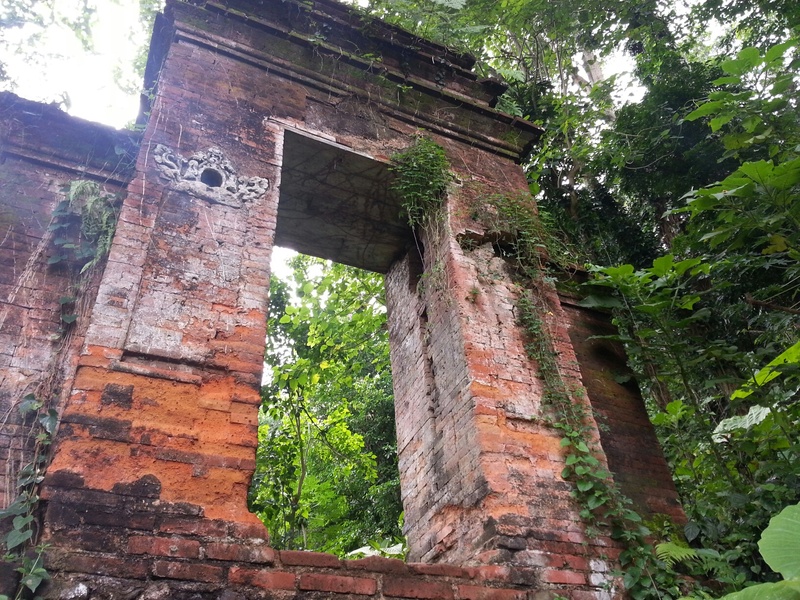 The palace was complex and had many things to see inside–not the quick pit stop I was expecting it would be. 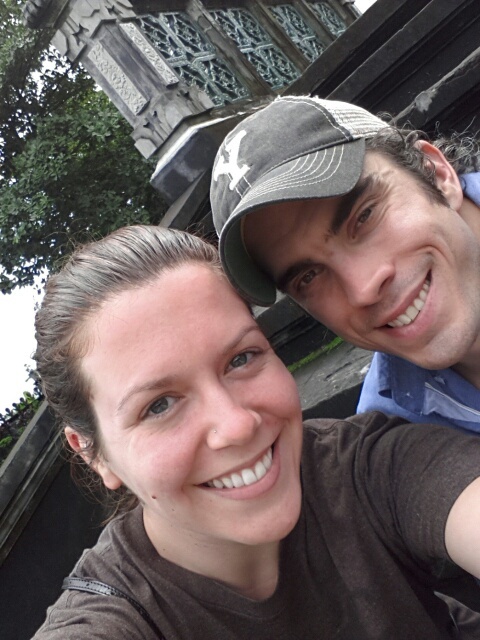 I loved the beautiful dark stone of the statues and pools, the bridges and numerous fountains. The plant life was incredibly colorful and lush and there was a temple within the complex as well. We ended up spending about an hour and a half there, I think, just wandering and looking. After returning to our driver and getting on our way, we snacked on some fresh passionfruit and bananas as we worked our way closer to Ubud. The beauty of traveling to place like Bali in December is that there are far fewer tourists and far better rates for lodging–ah, off-season… We knew our next hotel was on the main road in Ubud and we found it pretty easily after our driver dropped us off. 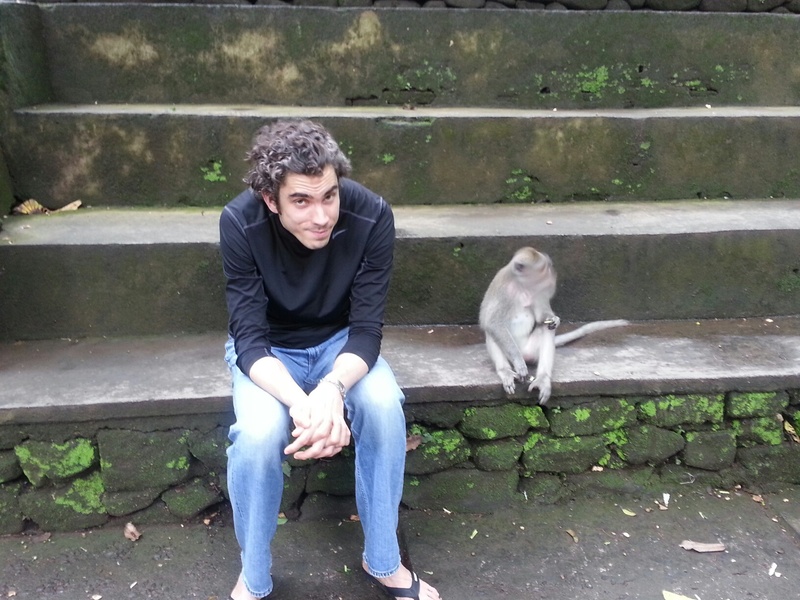 Right at the end of the road was the Sacred Monkey Forest and as we pulled into Ubud, I gasped to realize that the “stray cat” I thought I saw slinking across the street while traffic was stalled was in fact, a gray, long-tailed monkey. They freely roam outside of the Forest and aren’t shy about approaching tourists, not to mention picking their pockets. 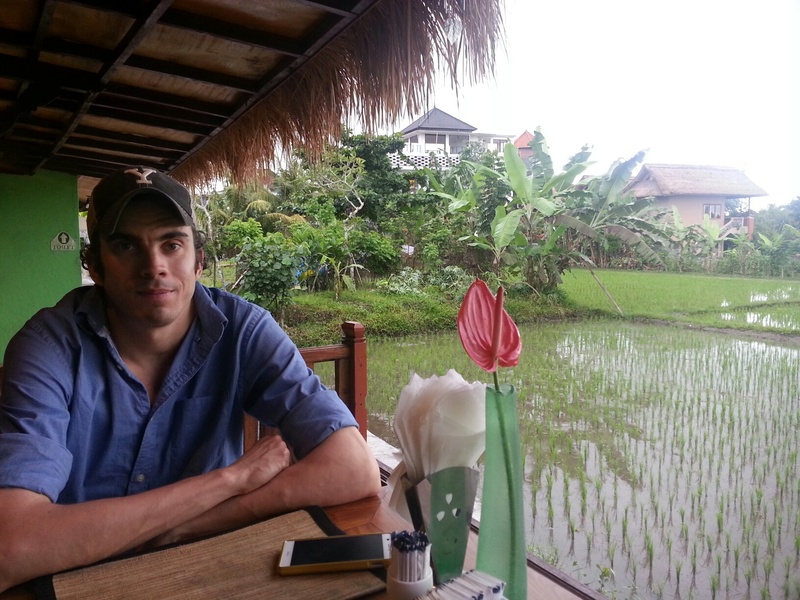 While a tropical thunderstorm kicked up, we ducked into a restaurant with an incredible view of a rice field and ate dinner to wait out the rain. 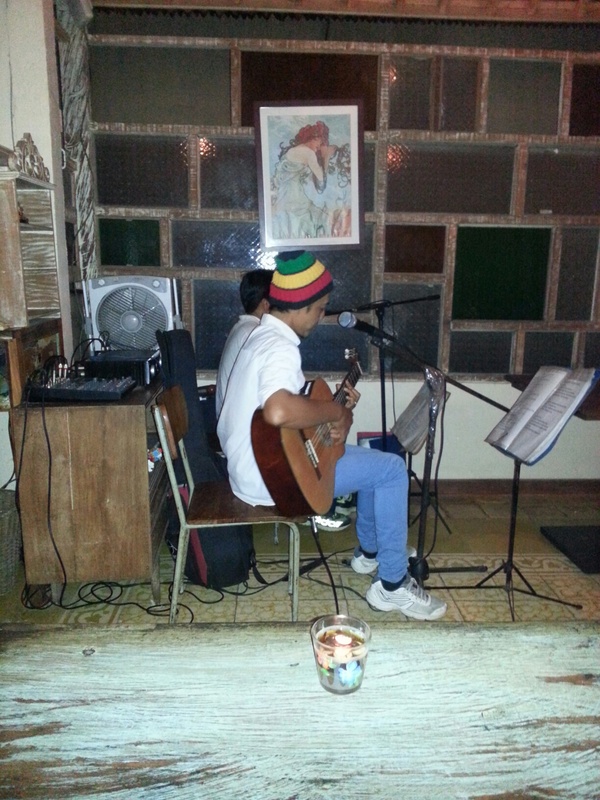 Later that night we went out and found a nice cafe where we heard live music and sat drinking fresh fruit juices for a few hours until the music (and thus, our evening) ended. We really enjoyed Tirtagangga! 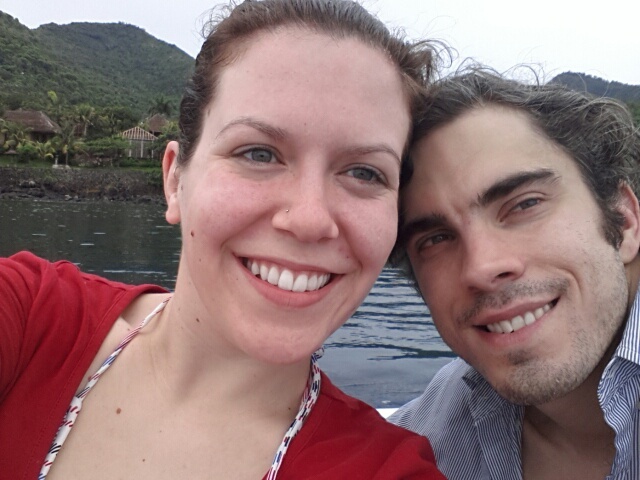 The warm, humid climate of Bali was SUCH a nice break from below-freezing, snowy Korea! First pathway into the water palace, which was not a singular building, but a large enclosure composed of a temple, many, many fountains and beautiful walkways. Musicians at a cafe after we made it to Ubud. They sounded great and were a nice accompaniment to our evening out. that provided a great escape from Korea’s freezing temperatures and just in time for Christmas. At first, we were unsure of whether we’d be given the time off, but after my school approved the vacation time use, we booked tickets and hotels and we were on our way… Our travel itinerary included Amed, Ubud and Kuta, which we saved for the very last day. View from the balcony of where we stayed… I wish we could have stayed forever. 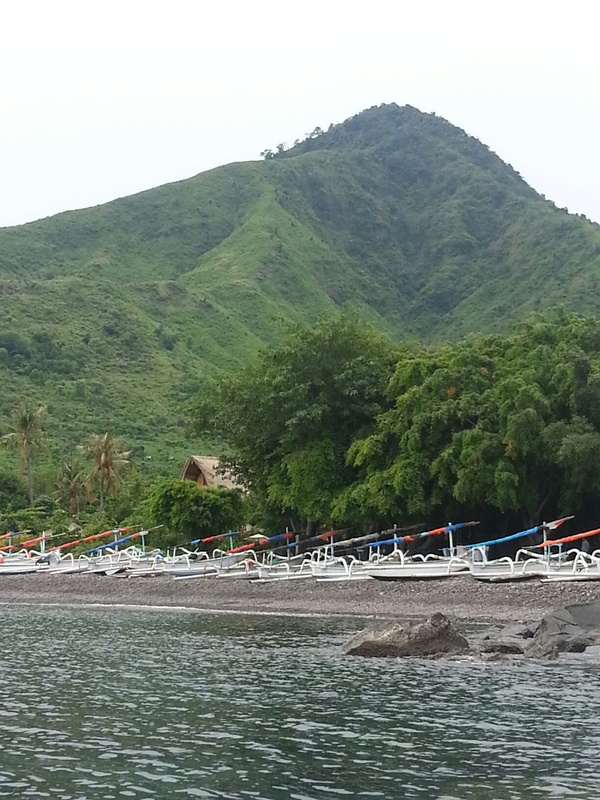 Upon arrival, we hit customs (which took a long time and we found ourselves prey to a rather pushy Australian proselytizer), then found a driver at the Denpasar airport who drove us all the way out to Amed–a three-hour trek. It was dark, there were few (if any) streetlights and the roads were narrow and winding. 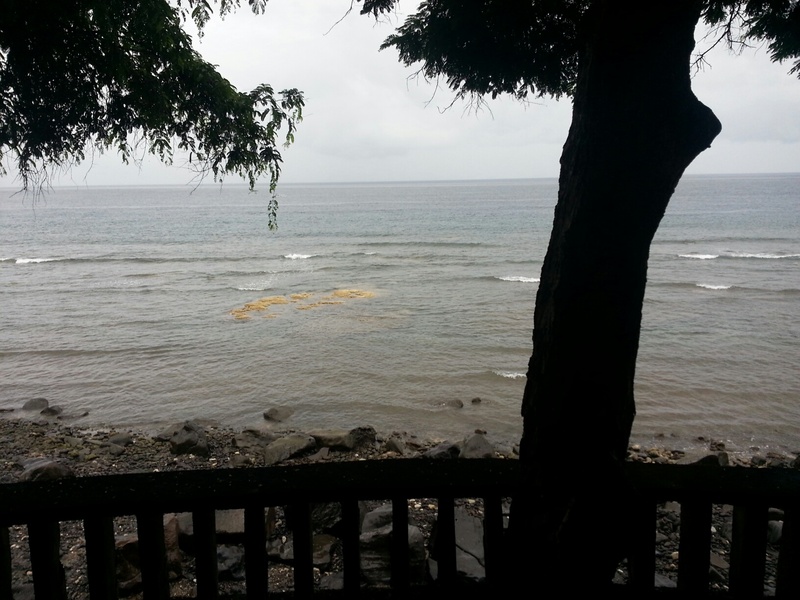 We could see glimpses of the moonlit sea as we got closer and closer to Amed–Jerry had booked us a couple of nights at a beautiful resort just a few yards from the water. Walking into our cabin, my nose was hit with the scent of plumeria blossoms that the the resort staff had placed throughout. Our room had a beautiful balcony that overlooked the water and we were the only people staying at the resort, as far as we could tell, which made the atmosphere so much more serene and relaxing. Fishing boat parking at the spot where we attempted snorkeling–as luck would have it, jellyfish were EVERYWHERE, so we ended up going back a little while later. 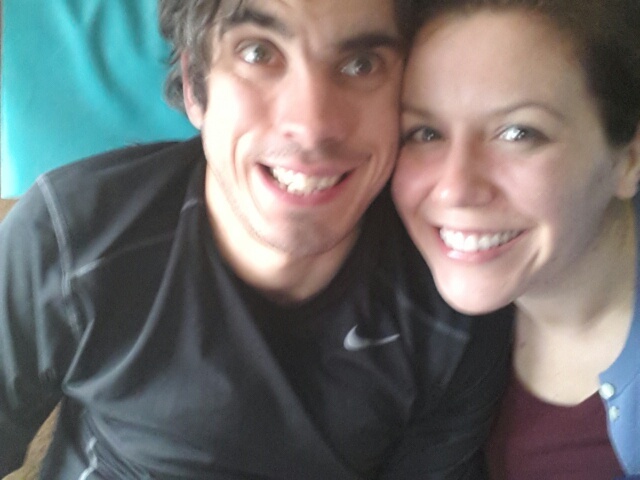 It was after 10 pm, but we hadn’t eaten since that afternoon on the plane. The resort is not exactly in a lively, happening area, so we asked the concierge at the front where we might find some food. “We can take you there,” he said, explaining that he and his friend would be willing to drive us to an open restaurant. We were all too happy to agree and soon found ourselves on the back of motorbikes coasting around the curved roads. I think I honestly had to stifle a squeal of excitement as I soaked in the feeling of the warm, humid air on my face and through my hair as we rode out to a nearby restaurant (a 10-minute ride). The hunger-induced headache that had been nagging me all night slipped away after we were served an amazing meal of fresh fish, rice, veggies and fruit juice. It was amazing, and subsequent meals proved just as delicious. I can’t get over how blue and clean and beautiful the water was… And warm, too! mid-December in Korea) and sank into bed. The next morning I woke up rather early, just in time to see the sun coming up over fishing boats hundreds of yards out from where our balcony was. After falling back asleep for a little while longer, Jerry and I took in breakfast at the resort and rented some snorkeling gear from the concierge. I looked down at my leg, which hurt pretty badly, trying to figure out what was hurting me all of a sudden. There were no cuts on my skin–I looked thoroughly, thinking I’d walked into the propeller blade on accident (that would sooooo totally like me)–and no reason why my leg HURT so much. Then I felt it again. Two unsuspecting, soon-to-be jellyfish victims. Thankfully, the stings were very mild and we hightailed it out of there quickly. small, brown squiggle in the water. A jellyfish. And there was another. And another. And another… All in all, there were MANY jellyfish… Jerry got his first sting around this time, too. We tried to swim away from them, but there were so many that it became really difficult. The stings were small, but annoying, to say the least. Jerry backed up at one point and managed to get two that stung his back at the same time–this later turned into a really big welt. Not cool, jellyfish, not cool. We gestured to the fisherman what was happening. He mimed spitting into his hand and rubbing it on his skin, which actually ended up being rather effective, but still… we didn’t really want to try to work around them, so we took the boat back to the resort and opted to snorkel there. To our relief, there were just as many beautiful fish to see and plenty of coral, too. 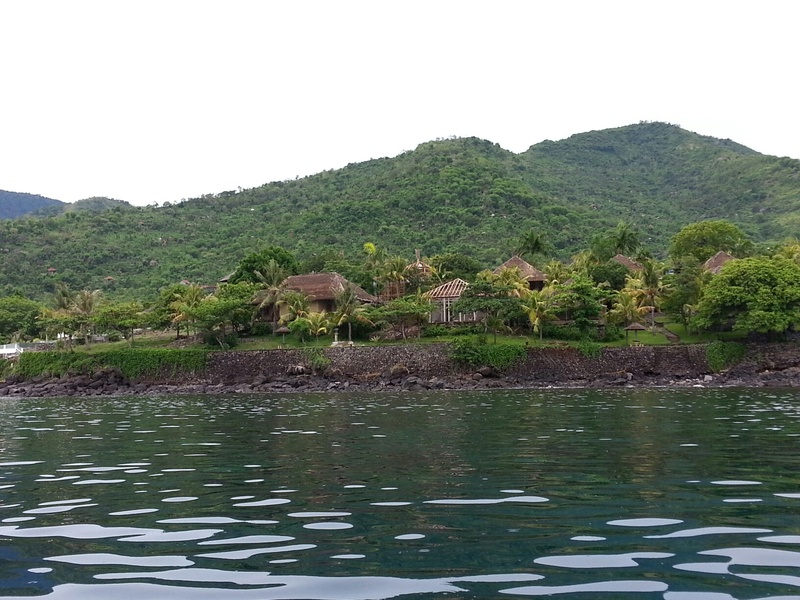 We hit another hotel for lunch at their restaurant, then got back in the water to snorkel some more. 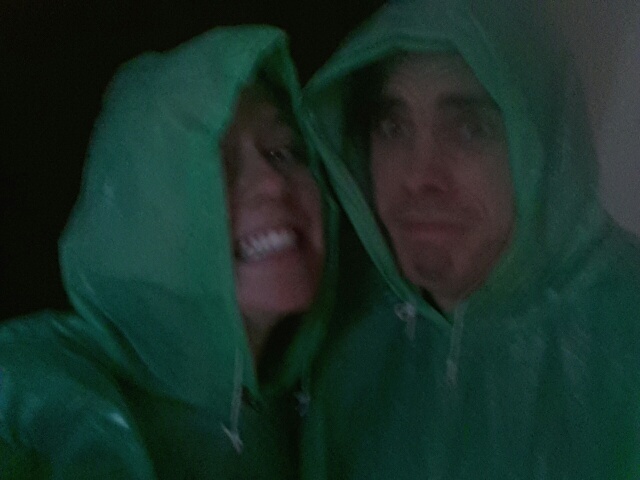 We relaxed with dinner and hung out in our cabin, watching an incredible storm over the ocean from our balcony. I take it as a very good sign that today went as well as it did. After not sleeping very much last night, I woke up a little extra early to make sure I could meet the HR manager at Bugil at the wee hour of 7:50 am. I made it to school a bit earlier than my expected time and waited for Ms. Kim, the HR manager to arrive and show me where I needed to go. Despite the fact that this transition has been in progress for about a month, I still had absolutely no idea of what exactly my Monday was going to look like. Armed with some get-to-know-you activities and game ideas for getting acquainted with my students later, I arrived with a notebook and a lot of questions. Note: This throw-you-in-the-deep-end theme is incredibly common for foreign teachers, from what I’ve been able to gather. It’s almost a rite of passage–you show up for a job at a Korean school knowing nothing and very quickly learn how well you handle thinking on your feet. Thankfully, I have met a few people who’ve been in this spot before (specifically other teachers who’ve taught at Bugil) and was able to reach out to one and received a lot of really helpful info to make me feel a bit more braced for what I was expecting to be a totally zany day. I’m not someone who likes surprises usually (unless they’re the good kind like “Hey, I brought you a food/coffee/food/flowers/a cool book to borrow/food!”), but I’m learning to roll with this and it’s really not so bad. Ms. Kim led me to a teachers’ meeting in a large room within the boys’ school. I was the only teacher in the room who was not Korean and thus, a bit lost about what was happening in the meeting, but the next thing I know, Ms. Kim is gesturing to me that I needed to move to the front of the room and I walk forward only to see the principal of the boys’ school urging me toward the microphone. It was New Teacher Introductions (unbeknownst to the girl with rather limited Korean) and it was now my turn to introduce myself. After realizing that my mouth-agape look probably wasn’t well-suited for the moment, I smiled and managed to give my name, say that I would be teaching English and bow politely before sitting down and silently kicking myself after realizing I TOTALLY could have said my little greeting in Korean and I probably would have sounded a bit less dorky in the process. Oh well. I sat back down and listened to the rest of the meeting, glancing at the papers my neighbors were holding and seeing that we were discussing what looked to be time tables and holiday schedules, but only understanding a few words here and there. The meeting concluded and I was whisked up to the teachers’ workroom on the fifth floor of the building and a handsome leather planner was given to me along with a school calendar. “The schedules aren’t even done yet…” another foreign teacher said to me. Oh, okay… but doesn’t the first class start in ten minutes? “The schedule’s different today because it’s the first day of school–they have orientation, so you might not have to teach at all today.” Whew! A definite relief if the printing of schedules was behind… Another foreign teacher showed me how to read the schedule once I got it and how to look for the classrooms I’d need, which was incredibly helpful. I still have a couple of to-do items for the week (I need to ask about my ID card for school and also get copies of the textbooks we’ll use in my classes), but I’m picking up a good vibe about everything and am glad to have had a smooth day so far. Tomorrow brings a more regular schedule, but it should be good, too.